1. )1 ball to every 2 players, players work within the grid and pass and move with a maximum of two touches (30 seconds work).In rest perios players perform one of the following (Lunges 2x10, Squats 2x10, Lateral Lunges 2x10) this is then repeated through twice. 2.) Resisted Sprints - In pairs players hold onto their partners t-shirts/shorts who sprints for a few strides untill their partner releases them and sprints out to the final cone around 10 yards. 3.) 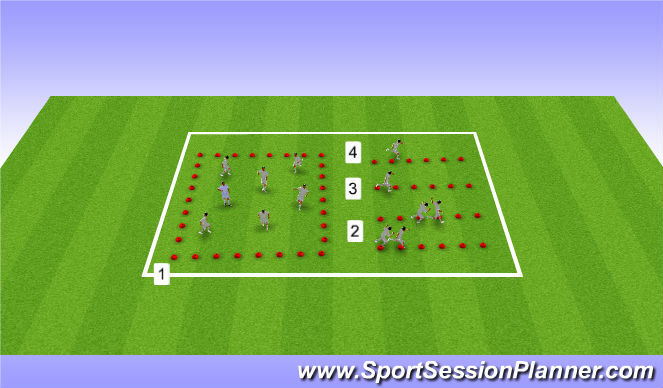 Reactive Sprints - In pairs players start on 1 knee, player 2 is 3 yards behind player 1, when ready player 1 sprints out and player 2 has to react try and tap their partner on the back X3 each. Players then perform the same drill but with players on laying face down this is again repeated 3 times. 4.) To finish players will perform shuttle races across a distance of 5-15m.